5 35 Be the first to write a review! 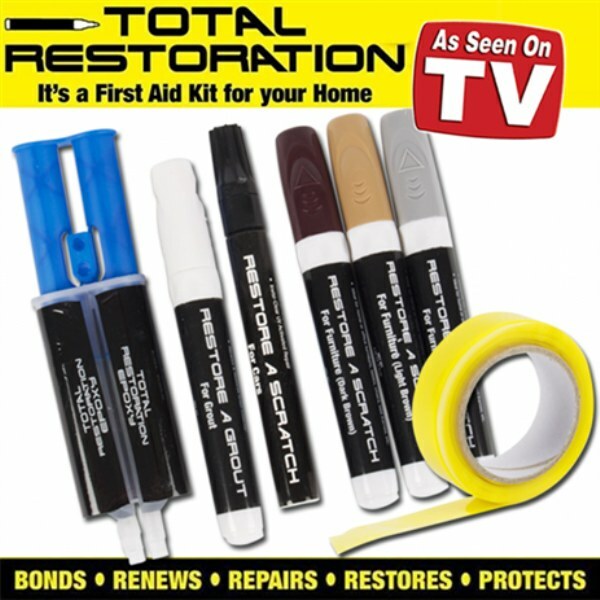 The Do it Yourself Home restoration Kit for small jobs. Inculdes: 1 Total Restoration Epoxy: Super Strong Epoxy fixes, fills and bonds on any surface: Ceramics, Metals, Glass, PVC, Leather, Concrete and More! 1 Restore a Scratch (Cars): An Invisi-Clear UV Pen that repairs light scratches on Cars, Motorbikes and More! 3 Restore A Scratch (Furniture): Diminishes light scratches and nicks on wood. Three Wood tones can be mixed to offer a shade matching any color on any furniture 1 Restore A Grout: Renews and Restores Grout instantly! Use in Bathroom, Kitchen, Patio and More! 1 Restoring Tape: Strong Tape that creates an air tight seal. Use on Pipes, Cords, Electrical, Tool Grips, Sports Grip and More!